Atari has announced the "Speakerhat", and it is just what you think it is... a Bluetooth hat with stereo speakers built into the brim. The Speakerhat has a retro appeal and the potential to become annoying in public. We reported in June on how Atari was making a return with their Ataribox games console, and more recently with some press renders and accompanying information. 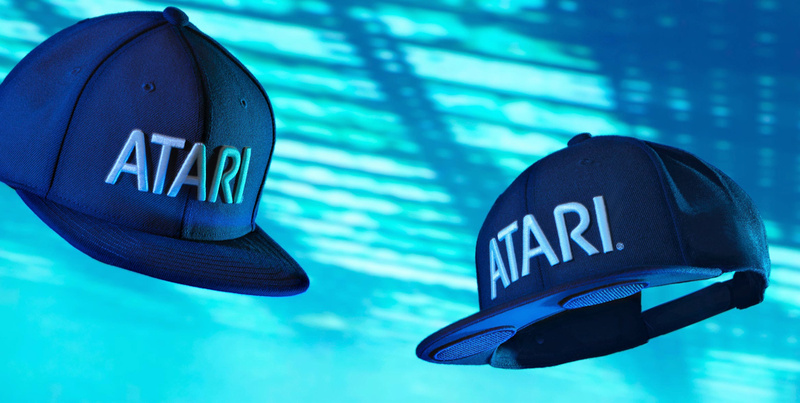 What we didn't expect was that the first wearable available in their "Atari Life" product line would be a cap with "...high-fidelity stereo speakers and microphone that can connect instantly to any Bluetooth-enabled device". From most angles, it looks like a standard Atari branded baseball cap, but look under the brim and you will notice two large speaker grills. We're in two minds about this product. On one side of the discussion, there is undoubtedly a retro-chic appeal to Atari, and I'm sure there will be people who would love to have the Speakerhat. It is a convenient way to listen to music on hot days where you would be wearing a hat anyway and without having to wear sweat inducing headphones, or taking your music into the garden with you without having to keep moving a Bluetooth speaker. Engadget also points out that this could be used by fitness enthusiasts who find earbuds slip out of their ears when they get sweaty. However, when you look at the other times people listen to portable music, the Speakerhat starts to make less sense. When listening to music with friends, having two speakers strapped to your head means you will constantly be trying to turn the music down to hear the conversation. The style of the hat and the concept is also one that is likely to be popular with the types of people who sit on the train and let all those around them “enjoy” music from their phone's loudspeaker. Soon it could become easier for you and your children to hear about how much that metal singer hates society, or in what manner that rapper claims to treat women. Help us make our minds up and share your thoughts of the Speakerhat in the comments below. Do you think nostalgia and the resurgence of retro brands will make it a smash hit? Or is this one a bit too far fetched to gain any real traction? Atari is seeking early adopters for its Beta program. Sign up for a chance to participate.